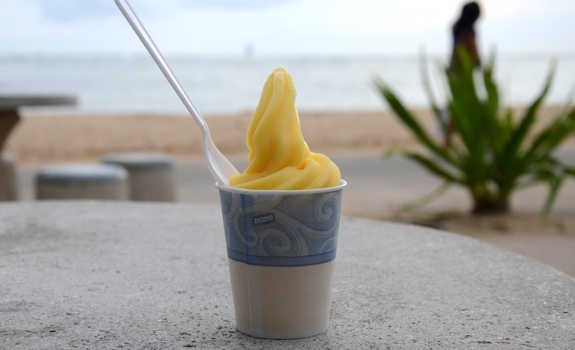 Pineapple Dole Whip in a cup on Waikiki beach in Honolulu, Hawaii. The Look: Like frozen yogurt, served in either a cup or a cone. The Pitch: It’s a lactose-free frozen dessert that’s similar to frozen yogurt or soft-serve ice cream. Comes in several flavours — pineapple and vanilla appear to be the most common. The History: I first tried Dole Whip as a kid at Disneyland. It was so good that we kept going back for more during our remaining days at the theme park. I later found it in Hawaii, and I try to get it whenever I’m back in the Rainbow State. The Taste: Pineapple is the quintessential flavour, but the taste varies depending on the shop serving it. The best I’ve had was at the café inside the main Hilo Hattie store in Honolulu. It’s creamy and smooth, with an overwhelming pineapple flavour. Sweet, but not overly so. The texture is soft and smooth, and it melts quickly in your mouth. 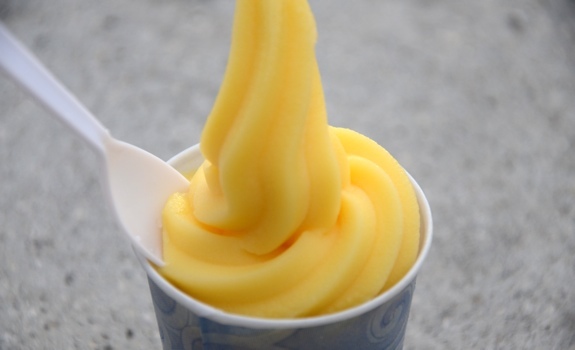 A close-up shot of a pineapple Dole Whip. This one isn't as light and creamy as the Dole Whips at other shops. Cost: About $3 to $4 for a tiny cup around Waikiki. Less elsewhere. Value for cash money: Depends on where you buy it. On Waikiki? A relative rip-off. At Hilo Hattie? A great deal. Availability: Hawaii, certainly, but it flies under the radar most of the time. Hilo Hattie has it in their café area, the restaurant at the Dole Plantation sells it, and there’s a stall in the food court at the otherwise bewildering trash heap known as the International Market Place on Kalakaua in Honolulu. There’s a place on the beach next to the Outrigger Reef that serves it, too. Nutrition? : Hard to nail down precisely, as serving size is tough to practically measure in real life. According to this website, a 1/2 cup serving works out to 80 calories. No protein, no fibre. But it’s also fat free, cholesterol free, and gluten free. You could certainly do worse in a frozen treat. The verdict: Excellent. I can’t get enough of the stuff.